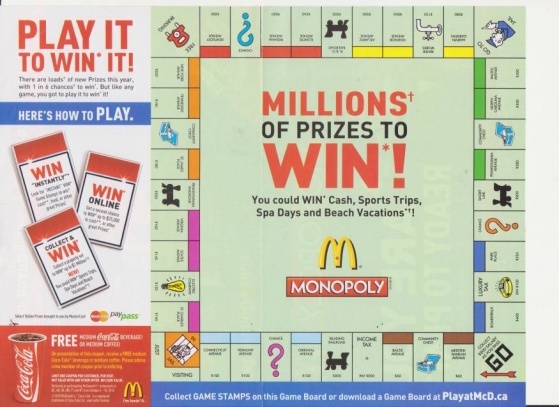 The McDonald’s promotional campaign "McDonald’s Monopoly " is a sweepstakes sales promotional action, which mimics the same principle of the real game “Monopoly”. In the frames of this game, customers receive tokens for the purchased certain menu items. These tokens should correspond to color-marched properties in order to receive various prizes. This promotional campaign originally was introduced in 1987 and it has had a huge success since then. A lot of game pieces are introduced every year, in addition to the other ones, which include prizes from instant fast-food items to the jackpot, which is $1.000.000. These games always keep MacDonals customers to come back to the store. The number of instant prizes make customers feel that they are winning. There’s also an online version of this game, which was introduced in 2003. This year, McDonald’s Monopoly started on September 23. With the already existed prizes, this year people can receive also a Dream Trip through Delta vacations, Beach vacation, another trips (the destination depends from the demand of the customer). McDonald's launched also another game promotion called Pre-Promotion. Pre-Promotion Sweepstakes lasts 1 week from September 23 till September 30. But it's more complicated, as customers should like McDonald's on Facebook or follow on Twitter to get some free codes. After finding out the principle of McDonald’s Monopoly promotional campaign, we would like to introduce you 5 interesting facts about it. In 2011, the rarest prize was $10.000, 1 could win from 205 million. It was even rarer than the prize of $25.000, the chance of that to win was 1 in 125.000.000. McDonald’s Monopoly is available in 15 countries worldwide, but the Monopoly game itself was sold in more than 110 countries. So, there you have interesting facts about McDonald’s Monopoly promotional campaign, which is considered to be one of the most successful ones in the history. Have you ever played McDonald's Monopoly game? Share your thoughts with us in the comments below! Get Started with Your Own Marketing Strategy. Grab a FREE Ebook on Facebook Marketing.